The activist pleaded guilty to public violence, possession of a dangerous weapon, and two counts of failure to comply with police orders. 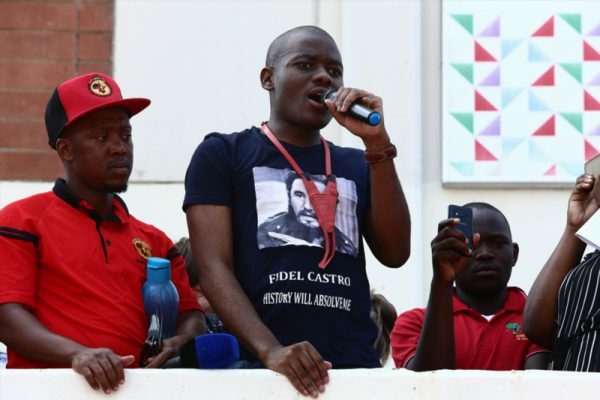 Bonginkosi Khanyile, best known for his role in the Fees Must Fall movement, has been sentenced to three years correctional supervision by the Durban Regional Court on Monday. Khanyile received a three-year prison sentence, suspended for five years, and a fine of R5,000, also suspended. He will, however, have to serve three years under house arrest. Police should be praised for not rising to the provocation of protesters, according to Magistrate Siphiwe Hlophe. In August last year, the EFF activist pleaded guilty in the Durban Magistrate Court to four out of 13 criminal charges related to the violent 2016 Fees Must Fall protests in KwaZulu-Natal. Khanyile’s advocate, Danie Combrink, read his client’s admission into the record before magistrate Siphiwe Hlophe and a full court, where many onlookers were clad in EFF regalia. The guilty plea is related to public violence, possession of a dangerous weapon, and two counts of failure to comply with police orders. In the admission, Khanyile admitted to unlawful assembly and using a slingshot to catapult stones at members of the South African Police Services. “My aforesaid actions caused the public peace to be disturbed and I was aware that such a result will follow my actions,” he said. He also pleaded guilty to failure to comply with police orders to disperse and desist from acts of violence on two separate occasions during the protests. “At all times I was aware that my aforesaid actions were unlawful and punishable by law,” he concluded in his admission. Khanyile was arrested in September 2016 during running battles between police and Durban University of Technology students which took place during the height of the protests. He was charged with incitement to commit public violence, illegal gathering, possession of dangerous weapons (a slingshot), obstructing traffic, causing a nuisance on public roads, and possession of explosives. The state did not lead evidence on the other counts, leading Khanyile to be acquitted of them. Hlophe recounted how Khanyile was captured on video throwing stones at police. “His actions caused havoc,” said the magistrate. The state and defence both closed their cases and Magistrate Hlophe decided on October 16 for sentencing. Reports from Khanyile’s probation and correctional officers are still expected, said Hlophe. The reports would be used as a consideration in sentencing. Khanyile made national headlines when his bail application made it all the way to the Constitutional Court after being denied at the lower courts. After close on six months in prison, the Constitutional Court granted him bail of only R250.